It opens with sleigh bells and a jaunty backing choir, and we're off into a fully realized Norman Rockwell painting, complete with roaring fireplace, children in stocking feet, and the jolly old grandpa around whom they've gathered. The grandpa is Bob Dylan, and yes, Bob Dylan is jolly. Holly jolly, even. 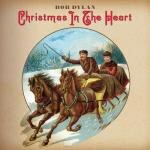 From the Currier & Ives-esque cover illustration to the Andrews sisters soundalikes singing backup, Dylan's charity album Christmas in the Heart is a full-on fruitcake. It's earnest and wholehearted and brimming with good cheer. There's a palpable joy in the man's withered croak, as he hobbles his crumbling voice over the some the most familiar terrain in American song. Dylan, he of the sharp jaundiced eyes and love-sick nihilism, has got the Christmas spirit, and he's got it bad. Self-producing under his oft-used and suddenly very appropriate pseudonym Jack Frost, Dylan delivers the most straightforward Christmas album imaginable, dusting off the stalest pop forms, mothballed tropes and hoariest roasted chestnuts of Christmas' past. Outside of a few delightfully bizarre choices -- the breakneck accordion polka of “Must Be Santa", the tinge of a fake Hawaiian accent on “Christmas Island", the way he sounds like a crazed street-corner vagrant haranguing the children in “Winter Wonderland” – he delivers the kind of lush, kitschy holiday showcase that’s generally better left to the likes of Michael MacDonald. The dissonance between his rough voice and smooth arrangement makes the album feel like something that you imagined in a dream. It's a double shot of straight sentimental corn syrup, and it's the closest Dylan has come to crooning since Nashville Skyline, his lovely 1969 country ode to domesticity. The years and cigarettes have had their way with the man's larynx, and he can't match the warm honeycomb baritone that surprised and confused his fans three decades ago -- frankly, he often comes off as a lunatic warbling carols with almost terrifying conviction -- but nevertheless, his damaged voice is full of warmth and sweetness. "Although it's been said many times, many ways… Merry Christmas to you," he sings, and he sounds like he means it more than Mel Torme ever did. For all the world, the record doesn't feel like a charity album or a goofball lark or an odd experiment -- it just sounds like the work of a dude who really, really loves Christmas.